Your bird will never look at fish the same after they enjoy this seafood sandwich. A tasty sandwich of (2) 1.5" small wood slices and 1 Puffy Sea Life creature sandwiched in between to bring out the Foot Toy Chewer in your feathered friend. 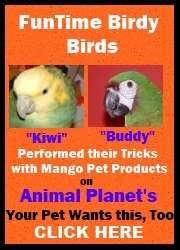 Ideal for Cockatiels, Conures, Senegals, Caiques, Amazons, African Grey, Eclectus, Cockatoos, Macaws and all similar sized birds. Seafood Sandwich Bird Foot Toy5giselleOctober 7, 2015This is a great bird toy! My green cheek conure loves it so much! He spends time just chewing on it, then when he wants to change it up he climbs to the highest perch, drops the seafood sandwhich to the floor and then starts over to retrieve it and drop.. some nights he does take it in to his happy hut at bedtime too.. Seafood Sandwich Bird Foot Toy5Jacque_LeeperJune 13, 2014My little one needs a boatload of these. She loves them! Seafood Sandwich Bird Foot Toy5Gail PiperApril 7, 2013My DYH Amazon, Haley, has developed a real liking for these toys. She likes to hold them and chew the pieces of wood to bits ... then play with the plastic foot toy inside. Keeps her busy for quite awhile.